A common challenge is how to minimize maintenance costs, maximize performance while improving the longevity of components. 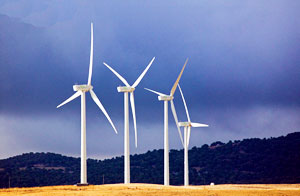 Turbine manufacturers and wind farm operators in Europe, Asia and the Americas have adopted Triple R as a standard to eliminate the problems of solids and moisture contamination that effects wind turbine gearbox oil life and performance. The AGMA/AWEA 6006-AXX standard, written by the American Gear Manufacturers Association, provides guidelines for operating and maintaining gearboxes for use in wind turbines, and a very important part of the standard is the cleanliness of the oil employed in the gearbox. During and after assembly it is suggested that all components be free of any contaminant and that during operation the gearbox oil be maintained with filtration to remove solids, water and sludge. Offshore turbines are constantly exposed to moisture. Contamination can enter gearboxes during manufacturing, be internally generated, ingested through breathers and seals and during maintenance. Internally generated contaminant particles are usually wear debris from bearings, gears, splines or other components resulting from micropitting, macropitting, adhesion, abrasion or fretting corrosion wear modes. Micropitting is widespread in wind turbine gearboxes. It reduces gear accuracy, may cause gears to become noisy and may escalate into other failure modes. The Triple R wind power series by-pass oil cleaner will maintain oil at better than new oil cleanliness levels.